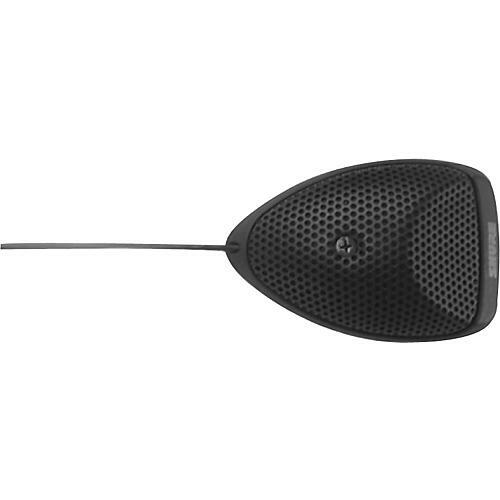 This Shure Microflex MX391 is a small, low-profile surface mounted electret omnidirectional boundary microphone designed for mounting on conference tables, stage floors, and podiums. The MX391/O mic features high sensitivity and a wide frequency range make them especially suitable for picking up speech and vocals in sound reinforcement and recording applications. The MX391/O has an omnidirectional pickup pattern making it highly suitable for recording or remote monitoring applications. Microflex Boundary microphones are the high-quality solution for a range of applications, such as altars, boardrooms and distance learning centers. Every Microflex plate microphone features a choice of interchangeable condenser cartridges. Microflex cartridges give you superior Shure quality sound for every application. In addition, their programmable switches offer the flexibility to be set for Push to Talk, Push to Mute or Push On/Push Off modes. Attractively designed with a low profile, professional appearance, the Microflex Boundary microphones come with an easy to use paint mask for your custom-color installations. The Shure MX391/O has an attached 12 ft (4 meter) cable terminated with a 4-pin mini connector and a separate preamplifier. A rubber strain relief is provided for applications where you want to remove the 4-pin mini connector and connect the microphone cable directly to screw terminals in the preamplifier. 2 relative to pin 3 of the preamplifier XLR output connector.